This will be a multi-part blog entry highlighting the most frequently asked questions of a Homeowners Insurance Claim. Part 1: Understanding the Insurance Adjusters Report. The adjusters report is a line item estimate prepared by the Insurance Adjuster showing replacement cost per room of your home. There are three main columns to the Adjusters report. RCV – Replacement Cost Value. The estimated cost of repairing a damaged item or replacing an item with a similar one. ACV – Actual Cost Value. The estimated value of the item or damage at the time of the loss. Generally, ACV is calculated as Replacement Cost Value (RCV) minus Depreciation. Depreciation – Loss of value that has occurred over time due to factors such as age, wear and tear, and obsolescence. 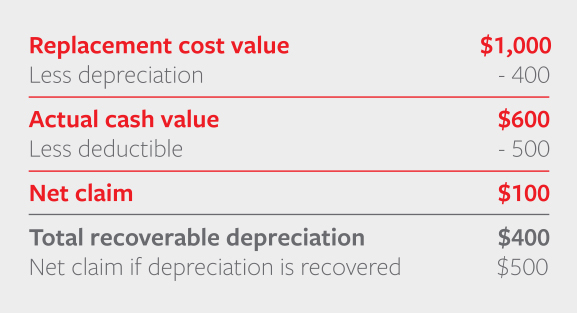 If depreciation is recoverable, the amount is shown in ( ). If depreciation is not recoverable, the amount is shown in < >. Above we see that drywall is paying $50.35 for full replacement. The initial check that arrives with the adjusters report will be the total of the ACV column less your deductible. When the contractor completes the project, they will submit a line item invoice for all items that were replaced or repaired in the Depreciation column that are recoverable. Now lets look at R&R Carpet. R&R stands for “Remove and Replace”. The carpet is paying $792.09 to remove the carpet and replace with new. Notice the Deprecation is in < >, meaning the deprecation is not recoverable due to this is an item that is expected to wear over time and will be replaced. So the actual payout for the carpet is the ACV of $643.76 as the depreciation is not recoverable. Your potential reimbursement is governed by the replacement cost. Please keep in mind that when repairing or replacing an item, you can recover only the amount you actually spend. For instance, in our earlier example we determined the RCV of your laptop was $1,000. If you purchase a replacement laptop for $900 and submit a request for the recoverable depreciation, The Insurance company will reimburse you $300 – the difference between the ACV of your previous laptop ($600) and the cost of your new one ($900). If you find that you cannot repair or replace damaged or destroyed item(s) for the replacement cost established on your estimate, you would need to contact your Claim professional before repairing or replacing the item(s). The rules that apply to your laptop are the same that apply to your kitchen cabinets, flooring, sinks, faucets, etc.